Peas aplenty . . .
Learning to grow veggies in a smaller garden is a lot like learning to cook for two once the kids are up and gone. No matter how hard you try, there is always enough left over for a kid or two. A few years ago I moved and had to leave my big old vegetable garden behind. For several years I grew veggies in raised beds only, but two years ago we tilled up a small vegetable garden. It's about a fourth the size of my old garden. After more than 20 years planning and planting my garden, the natural inclination is to order the same amount of seeds. I've been doing well with it and have learned that you really don't need two to three 30 foot rows of bush beans. Ten feet will provide more than enough for the family - unless you intend to can them. I also learned that two or three zucchini and summer squash plants will provide fresh veggies all summer and you won't have to worry about trying to give the excess away. I even learned that I only need a couple rows of potatoes to eat as new potatoes. But, peas still give me a problem. I used to plant two pounds of peas. I cut that down to one pound and discovered it was more than I needed. This year I bought a half a pound of pea seed. It didn't look like a lot, until I soaked them. I planted them along my pea fence in the garden and suddenly realized I had tons of peas left to plant and no place to tuck them. Because they were tall telephone peas, my choices were limited. I left them sitting overnight, but woke up with them on my mind. Visions of lush green foliage and juicy pods swam in my head and I knew that I couldn't just let them go to waste. So, you may be wondering what I decided to do with them. I filled planters with soil and tossed in the pea seed and set them along my back deck where they could climb the lattice - but I still had some left. I dug up the dirt under a little elm tree and threw the rest into the soil. I'm not sure how well they will do, but the area gets full sun from early morning until past noon - in these parts, that means a full seven hours of sunlight. Whether they perform well there remains to be seen, but one thing is for sure: I'm sure to be the talk of the town when the neighbors discover telephone peas climbing up my elm tree. There is something about Sunday mornings that fills me with joy, especially sunny summer Sundays. It isn't because its the traditional day for church, because I don't typically attend church. I do, however, try to take the day off and forget about the cares of the world. In the summer, that means waking to the song of the robin and dreamily considering any garden tasks I have lined up for the day. I take my coffee outside on Sunday mornings and spend some time listening to the birds and admiring nature. This Sunday I am contemplating finishing planting the garden. I have potatoes and peas to plant, which admittedly are going in very late this year, but my motto has always been that late veggies are just as sweet as early veggies and that it is never too late to plant a garden. I have good reasons for planting late. Spring was extremely late this year and I've been busy redoing raised beds and building a few new ones, transplanting flowers and generally moving dirt around. One of my new additions to the perennial bed this year is Siberian iris. This iris came from the divisions of someone else's bed. It had been potted and I wasn't sure how well it would do this year. I tucked it into a raised bed and it's growing like a weed. I think I will even get blooms this year. I also built a white birch fan trellis yesterday that will be the home of scarlet and heavenly blue morning glories. Stay tuned to pictures of the trellis and fence that I tucked into an unused corner of my backyard . . .
For now, I'm off to plant the garden and dream of red tomatoes, juicy peppers and fresh cukes. Offering Birds Nesting Material - A great way to add life to the garden! I just discovered this delightful Feather Your Nest Wreath and wanted to share it with you this morning. The wreath comes prefilled with an assortment of feathers, cotton, string and other natural fibers that birds prefer for building nests. It is designed to hang in on a garden fence or door where you can watch birds as they investigate and select just the right materials for nest building. The materials in this wreath are selected with North American Birds in mind. As a kid, I remember my mother hanging bits of fluff and small scraps of soft yarn over the clothesline and watching for birds to gather them for nesting material. She was always delighted when some inquisitive bird snatched up the nesting supplies. This wreath does all the work for you by supplying nesting materials ready for birds to use and provides a nice variety of materials. 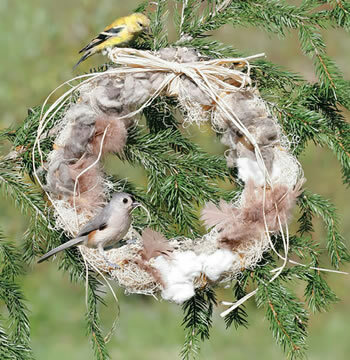 If you prefer to make your own wreath of nesting materials for the birds make sure to choose natural fibers. According to All About Birds, birds will use a variety of natural materials such as feathers, pet hair, moss, dried leaves, strips of bark, pine needles, and plant down or fluff. Avoid any synthetic fibers such as plastic, tinsel and cellophane. You should also avoid offering dryer lint. A few years ago my niece purchased the house my mother lived in for 20 years. Although we lived in other houses, it's the house I think of when I remember my childhood. I lived there from the age of 9 until I went away to college. I visited the house for the first time the other day and was struck by the beauty of the land and the rolling hills behind the house. I believe that the land you live on, whether you own it or not, gets in your soul. I still feel a connection there to a life of long ago. Many of my mothers flowers still grow around the home. One of her favorites was her phlox. My niece graciously shared some of those phlox with me. I left them outside in a box for the night. By morning they were severely wilted and for a moment I chastised myself for not taking the time to transplant them the night before. I shook off the dirt from the roots and tried to gently tease them apart with my hands. I say that, because it's what garden experts say and because I am guilty of saying it myself when explaining how to divide perennials. There was no teasing! The roots were bound so tightly together that I had a difficult time cutting them apart. I filled a bucket with water and diluted Miracle-Grow and soaked the roots. This served two purposes. It made dividing them easier and revived the poor plants. I also added a quart or two of water to the new planting hole, settled the plants in and watered them again to give them the moisture they needed. These amazing plants perked up within hours and look like they are always grown in my backyard. I can't wait for them to bloom and fill my yard with the fragrance of a simpler life that we lived so long ago.